Christian life begins with the sacrament of baptism, the full initiation by water and the Holy Spirit into Christ's body the Church. Baptism is the outward and visible sign of an inward and spiritual Grace. Through this sacrament we become united with Christ in His death and resurrection and forgiven of our sins so that we may participate in a new life in the Holy Spirit. Baptism is an important act of obedience to God's will and a sign of His love and adoption for the persons being baptized. Families that wish to have a member baptized should be members or intend to become so. 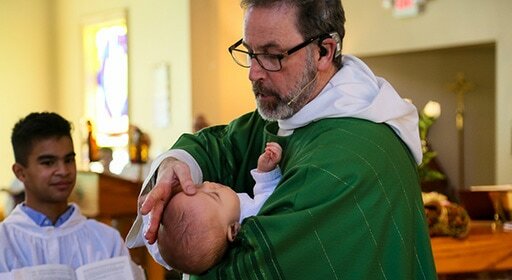 Infant and child Baptism is only appropriate when at least one parent is an active member of a congregation and thus willing and able to raise the baptized child as a Christian within the Church and congregation. Historical and cultural affinity or having been baptized as an Episcopalian oneself are not, without an ongoing commitment to a Christian life within the Church, a sufficient justifications for Baptism of a child at an age when that child is incapable of making commitments for him or herself. In the Episcopal Church, Baptism is the initiation by water and the Holy Spirit into full membership of the Church. Water is its essential visible sign, and the candidate is either immersed in it or has a liberal quantity poured over them. There is no other requirement than Baptism in order to participate in the Holy Eucharist; and equally no person who is not baptized may do so. Our church recognizes all baptisms performed with water in the name of the Father, the Son, and the Holy Spirit: this means that anyone baptized in a Christian church of any denomination may take communion in an Episcopal Church. Baptism initiates the candidate into the communal life of the congregation. In our Church, therefore, Baptisms are normally administered publicly during the Eucharist as the chief service on a Sunday or other feast. Easter, Pentecost, All Saints' Day and the Baptism of Our Lord Jesus Christ are especially appropriate days, as is the day of the bishop's visitation. Requirements for baptism are those of the Book of Common Prayer (pp. 298, 312, and 858) "Sponsors of adults and older children present their candidates and thereby signify their endorsement of the candidates and their intention to support them by prayer and example in their Christian life. Sponsors of infants, commonly called godparents, present their candidates, make promises in their own names, and also take vows on behalf of their candidates." "Parents and godparents are to be instructed in the meaning of Baptism, in their duties to help the new Christians grow in the knowledge and love of God, and in their responsibilities as members of his Church." No particular number of sponsors or godparents is required, although three people or two couples is the norm. We recommend that at least one of the sponsors or godparents be an active member of Holy Spirit. Other sponsors or godparents may be chosen at the discretion of the parents but should be practicing Christians active in their church. 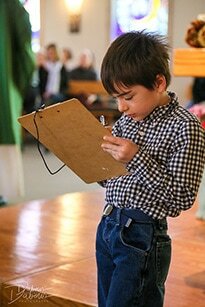 Church sponsors or godparents should encourage church participation by supporting the candidate's enrollment in Christian Education classes and by encouraging regular attendance at worship services. Every member of the church is encouraged to seek ways to support the newly baptized in their journey to know and love God. Other dates can be arranged with the Rector. Emergency baptism may take place at any time. These baptisms later may be recognized at the next baptismal feast day with the candidate's and sponsors' full participation in the baptismal liturgy with the exception of the initiation by water. In an emergency situation where no clergy are present, any baptized person may perform baptism with water "In the Name of the Father, and of the Son, and of the Holy Spirit." Please contact the church office for times and dates of baptisms and instruction sessions.